Enjoy the largest wind tunnel in Europe. 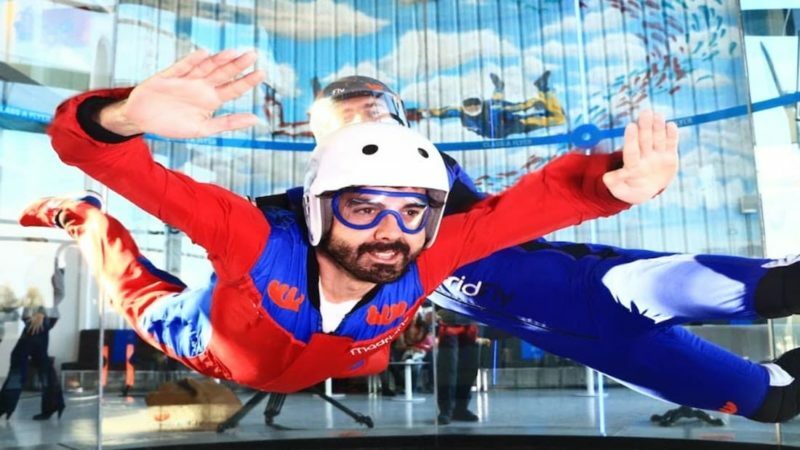 Experience of free fall without having to jump out of an airplane. Your instructor will teach you how to fly in the flight chamber. Air tunnel in Madrid. 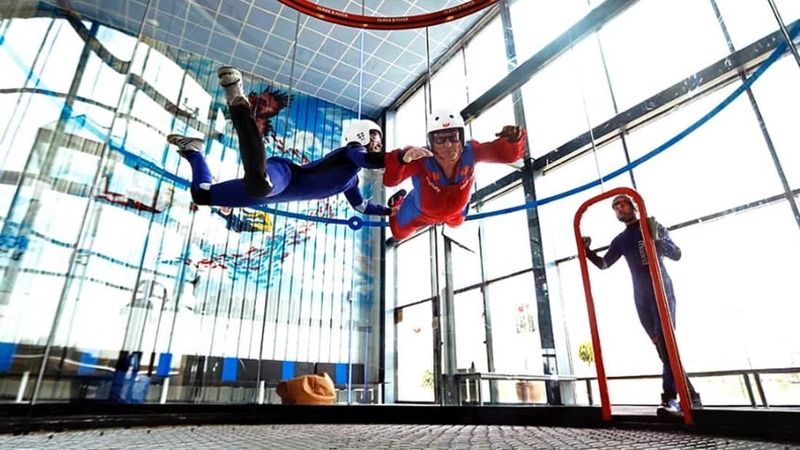 Come and discover the largest wind tunnel in Europe, offering you the experience of free fall without having to jump out of an airplane with DREAMPEAKS. Duration: 2 hours approximately plus transfers by car from Madrid city. The entire first-time flyer experience takes approximately 2 hours from start to finish. Often flyers might stay at the wind tunnel for a while longer, depending on if they want to watch other flyers or have something at the restaurant. The actual time that a first timer is in the flight chamber is 60-75 seconds per flight. This is actually longer (almost twice the time) than a tandem freefall experience would be. 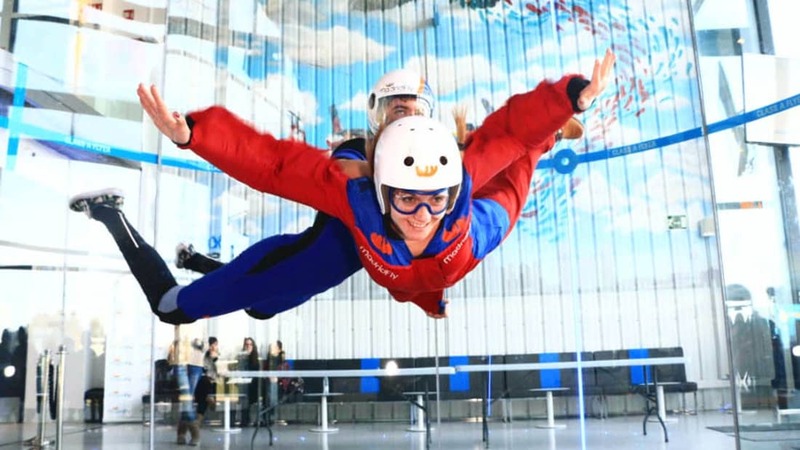 If you reserve a package that includes 2 flights, you will have 2 turns in the wind tunnel with an instructor lasting at least 60 seconds each. Fly in an air tunnel in Madrid with Dreampeaks! A fun indoor adventure. Full classroom briefing with a certified instructor who will walk you through the entire process, followed by 2 flights of 1 minute duration per person. All the equipment required for a safe flight: helmet, goggles, flying suit. -Air tunnel Flying is completely safe. It is comparable to being in a swimming pool. -We have highly-trained and certified (by the Tunnel Instructor Organisation) instructors, who will guide and supervise you at all moments. This guarantees a safe environment for the enjoyment of your flight session regardless of your level of experience. -If you are pregnant, have past spinal injuries or have a previous shoulder dislocation, it is recommended that you do not fly. If you have a physical or mental disability of any kind, be sure to mention this when booking your flight. Activity not recommended for people with heart or bone problems, or excessive overweight. -Must not suffer from vertigo. -Minimum age 5 years old. Very fun and well organized. Surely I repeat the experience.